Fully automatic inflation and dynamic measurement technology that varies the inflation process according to real-time blood pressure detection to reduce measurement time and increase user comfort. Stores 180 blood pressure readings (90 x 2 users) with date and time recordings. Automatic Irregular heartbeat (Arrhythmia) detection and WHO Hypertension Indicator. Push-button access to Average blood pressure calculation. 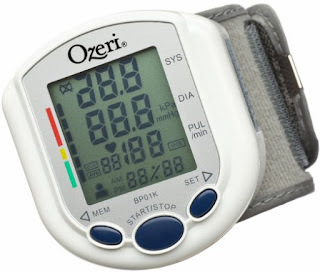 Ozeri BP01K CardioTech Pro Series Digital Blood Pressure Monitor with Heart Health and Hypertension Indicator is perfect for tracking your blood pressure! I love that Ozeri BP01K Digital Blood Pressure Monitor stores 180 blood pressure readings so I can look back and see whether my high blood pressure is improving. I also love how easy to read the screen is. The numbers are large and the range indicator is also very easy to understand and read. This is a terrific way to track your blood pressure readings and I've tested the readings with another monitor that I have and can confirm that they are accurate. I highly recommend this Ozeri BP01K Digital Blood Pressure Monitor!